A recent headline in The Daily Telegraph. Photo: Howard Lake/flickr. 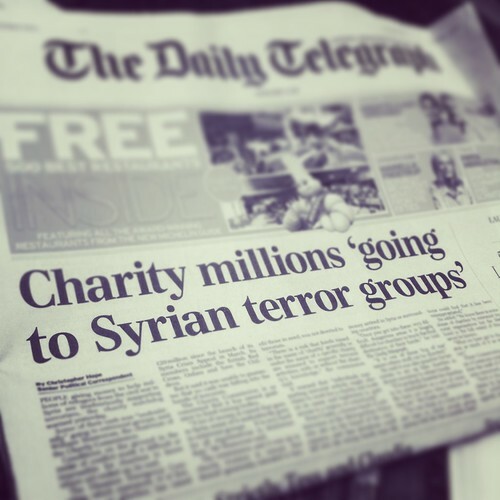 The UK’s Daily Telegraph ruffled a few feathers earlier this month by building a story around a few out-of-context remarks by the head of the UK’s Charity Commission to suggest that millions of pounds raised to assist victims of the conflict in Syria were being diverted to terrorist groups. The Charity Commission reacted swiftly to correct the story, pointing out that they possessed no evidence of any such diversions and that they work very closely with charities to minimize the risk that any could occur. Fears of charitable donations being diverted away from their intended recipients are nothing new. Nor are accompanying fears that diverted money is ending up in the hands of people with less-than-good intentions. What is relatively new is how these fears are being addressed since the launching of the “global war on terror” in the wake of the 11 September 2001 attacks in the US. Humanitarian organizations have long recognized that they have a responsibility towards both their donors and their beneficiaries to ensure that aid reaches the people it was intended for. Many organizations have developed their own systems of checks and balances to ensure that it does. However, it has long been recognized, both by donors and charities, that in conflict and emergency situations no system is perfect and there is always a risk that some aid is diverted or ends up in the wrong hands. What has changed with the dominance of a counter-terrorism discourse is that this risk of diversion has been defined as a security threat due to the fear that those wrong hands are terrorist hands. A problem that had been largely left up to charities, charity regulators and government aid agencies to address suddenly became an area of interest to counter-terrorism policymakers. Under US-leadership, a raft of new policies and measures were introduced. Unfortunately, as has been documented in a recent study commissioned by the UN, some of these measures have become major obstacles for the work of charitable and humanitarian organizations. Administrative costs and hurdles have increased, access to banking services has been disrupted, requirements to vet beneficiaries have opened organizations to accusations of spying, and the fear of prosecution for aid leakage to undesirable groups in conflict zones has caused organizations to curtail or redirect their operations. This obviously has negative repercussions for the intended beneficiaries of these organizations. Concerns that people in need are not receiving the assistance they require are being trumped by concerns that charitable funding may end up funding terrorist attacks. As I recently argued elsewhere, this is an avoidable situation because current measures to prevent misuse of charities for terrorist purposes are actually undermining efforts to prevent terrorism by contributing to a ‘humanitarian vacuum’ that can be exploited by armed groups, making financial flows harder to monitor, fuelling anti-US discourse and alienating potentially important local partners. Concerns that people in need receive the assistance they require are interlinked with concerns about preventing terrorism so policymaking needs to consider both concerns together. Part of the problem, particularly in the US, is that too much policymaking around charities and counter-terrorism has been like a strict form of parenting: lots of restrictive rules, threats and punishments, and little trust. The dynamics in the relationship need to change. Governments, including the US government, need to start treating charitable organizations as grown-ups. The charitable sector, for its part, needs to strengthen its efforts to demonstrate that it is assuming its responsibilities and that charities do not deserve to be treated like children. The first step towards a new relationship is through a sincere dialogue to build trust, encourage an open discussion of everyone’s concerns and identify solutions that are in everybody’s interests. Such a dialogue needs to take place at both the national and international levels and it should bridge three divides in particular. First is the government-charity divide: dialogue will help to reinforce understanding that there are common interests at play around this issue and the best approach is one of partnership. Second is the security-humanitarian divide: as argued above, the security and humanitarian concerns are inter-related and need to be considered together. Too often policy-making is done in silos. Government departments and agencies, NGOs, academics and think tanks from all concerned fields need to work together to address this issue. The third divide is between Western and non-Western actors. In our increasingly interdependent world, the humanitarian landscape is becoming more diverse and non-Western actors are now playing an important role in overseas aid. Western and non-Western actors need to find common frameworks that promote and support the work of charitable organizations wherever they are based while minimizing the threat of diversion to suspected terrorist organizations. Some efforts in this direction have already been made. What is required now is strong leadership from key actors like the US government to build a broad dialogue involving all concerned stakeholders. The result will be more efficient aid delivery and more effective counter-terrorism policies. Owen Frazer is a Program Officer in the Mediation Support Team at the Center for Security Studies, ETH Zurich.